When they launched their new headphones at this year’s NAMM Show, Yamaha pointedly linked them to one of their classic products of yore. Despite having been out of production for many years now, the Yamaha NS10 is still unquestionably the world’s most widely used nearfield studio monitor, and for (mostly) very good reasons. So, in stating that their HPH-MT7s share the same “sound philosophy” as the NS10s, were Yamaha identifying real similarities between the two? Or were they merely exploiting their own heritage for marketing purposes? Those who appreciate the NS10 ‘sound’, me among them, tend to think of it as being distinctive for two reasons. One is that, unlike the vast majority of small monitor speakers, the NS10 is an unported, sealed-box design. The down side of this is that its bass extension is feeble; the up side is that its time-domain performance is excellent, putting across musical dynamics with greater immediacy and accuracy than typical ported designs. The other notable feature of the NS10 is a frequency response that favours the all-important mid-range; whereas many other speakers artificially hype the highs and lows, the white-coned wonders never let you ignore what’s going on at 1kHz. The light that they shine on a mix is neither flattering nor forgiving, and as a result, it’s all the more illuminating. What would it mean, then, for a pair of headphones to share the ’NS10 sound’? You’d expect time-domain issues to be rather different in headphone design generally. Whereas loudspeaker designers are dealing with larger cabinets, much higher sound pressure levels, and heavy bass/mid drive units with significant inertia, a pair of headphones has only a single, full-range driver per side, which does not need to shift huge amounts of air. And although the NS10’s sealed-box design is relatively unusual in the world of small monitors, the large majority of headphones already have closed-back earcups anyway, making them in effect sealed-box units. That’s not to say that all headphones offer perfect time-domain performance; more that the specific problems that plague cheap ported monitors are unlikely to arise to the same extent in typical closed-back phones. Moving to the frequency domain, however, it’s certainly true that many headphones share a ‘smile curve’ that hypes the extreme highs and lows, offering a lot of spurious high-end ‘detail’ and low-frequency thump at the expense of mid-range clarity. Especially in closed-back models, this deviation from neutrality can be so large as to present real problems for mixing. If you value the NS10 sound for its prominent and revealing mid-range, and you want a good-quality pair of headphones to provide a similar perspective on your mixes, the options are rather few. Which brings us back to the not-so-snappily-named Yamaha HPH-MT7s. They are available in conventional black, but also — riffing on the appearance of the NS10 and other Yamaha speakers — in a striking but smart piebald livery, where black headband and earpads contrast with white earcups (see photo). Both versions, alas, come with a captive cable, which doesn’t seem to be easily removable or replaceable. Nor is it curly, which is a black mark against it in my book; maybe I’m just clumsy, but in my life, a 3m-long straight cable just gets caught on things all the time. Those white earcups aside, the physical design of the headphones is very conventional. The earcups are large enough to enclose the ear, and pivot both laterally and vertically. They stay on your head and they’re pretty comfortable. 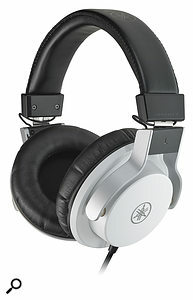 They also seem solid and well built, and offer reasonably good isolation from external sounds. In fact, apart from that captive cable, the only aspect of the design I’m not keen on is that it seems prone to mechanical noise: even small head movements provoked noticeable squeaks, creaks and clunks. No accessories are included apart from a basic carry bag and a removable mini-jack-to-quarter-inch adaptor. The impedance of the HPH-MT7s is listed as 49Ω at 1kHz, and a sensitivity figure of 99dB/mW is quoted along with a frequency response of 15Hz to 25kHz — not something anyone has ever claimed for the NS10. I had no problem driving them as loud as I needed from any source, but there was a noticeable loss of low end with the headphone out on my laptop, so a more powerful headphone amp is probably a good idea. Listening to music on headphones is very different from hearing it on loudspeakers, even when those loudspeakers are positioned in the nearfield in an acoustically dead environment. It would be optimistic in the extreme to hope that any pair of headphones could reproduce exactly the experience of hearing your mix through a pair of NS10s. Dial down your expectations to a more reasonable level, though, and I think the HPH-MT7s have enough in common with the famous monitor speakers both to make them stand out from the competition, and to make them a more useful mixing aid than most closed-back headphones. As the specs suggest, they do indeed cover the full frequency range: so far, so unlike NS10s. However, like NS10s but unlike the majority of studio headphones, they emphasise the middle rather than the extremes of this frequency range. Imagine a broad, low plateau stretching perhaps from around 150Hz to 3kHz, with slight peaks at either end of it, and you’ll have an idea of the way the HPH-MT7s come across to me. They don’t deviate so far from neutral as to make music listening unpleasant, and nor is their response so uneven as to cause problems in other areas — you won’t find yourself overlooking tape hiss or sibilance — but what they do offer is a very useful extra focus on the most important and dense part of a mix. For the last couple of years, I’ve been an avid user of Sonarworks’ Reference 3 headphone calibration plug-in, an EQ that is tailored to a specific pair of headphones (in my case, Sony MDR-7506s). This can be set to make them sound neutral, but it can also be set to emulate the frequency response of various other playback systems, including a pair of NS10s. So, out of interest, I did an A/B comparison between the HPH-MT7s and the Sony/Sonarworks combo. The HPHs definitely had something of the character of the NS10 emulation, and something too of the ‘French hi-fi’ setting; but they were also cleaner and closer to neutral than either. Which, I think, is exactly what I’d have hoped for. Having made my share of mistakes over the years, I’m now reluctant to mix on headphones alone; my experience is that mixes that sound good on loudspeakers usually work well on headphones too, but the reverse isn’t always true. However, I did quite a bit of mixing on these HPH-MT7s during the review period, and never once got a nasty surprise when I heard the results on studio monitors or other loudspeakers. Apart from that fixed cable, the HPH-MT7s have all the attributes of a good pair of general-purpose studio phones, and their noticeable but controlled mid-range lift is much better suited for mixing purposes than the ‘smile-curve’ response so common in other models. In a crowded sector of a crowded market, it could be the key factor that makes the Yamaha HPH-MT7s stand out from the competition. If you’re looking for a pair of closed-back ‘phones with a mid-range focus rather than a ‘smile-curve’ sound, other options are fairly limited. Shure’s SRH840 and SRH940 definitely place the emphasis in the upper mid-range, with a tonality I recall as being rather more aggressive than that of the HPH-MT7s. Planar magnetic designs such as the Fostex T40RP MkIII and Oppo PM3 have a natural tendency to play down the extremes of the frequency spectrum, but they also have a characteristic sound that’s rather softer than that of the Yamahas. With a broad but controlled mid-range focus, they really do have something of the NS10 about their sound. Yamaha have got a lot of things right with these headphones. The HPH-MT7s should prove good studio all-rounders, and their distinctive mid-focused frequency response makes them more useful than most for mixing.